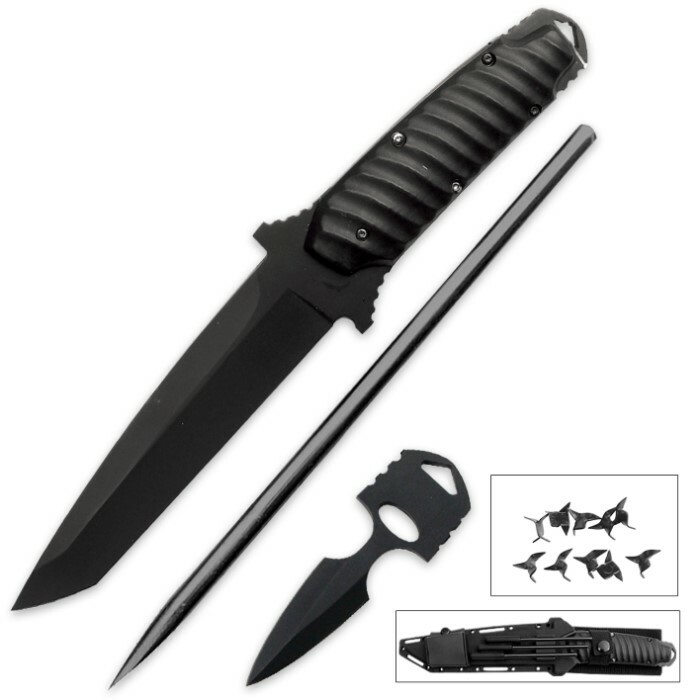 Introducing our Ninja Tanto Battle Package! This package comes with all of your stealth warrior essentials. Most importantly the oversized knife with thick full tang blade forged using heat treated stainless steel. Includes a guard with thumb ridges for comfort and protection from hand sliding. The steel rests between ABS side panels with a textured grip. Now on to the extras... Pull on the back of the handle to release the hidden doubled edged push dagger! The dagger is sharp, full tang, and completely unexpected. 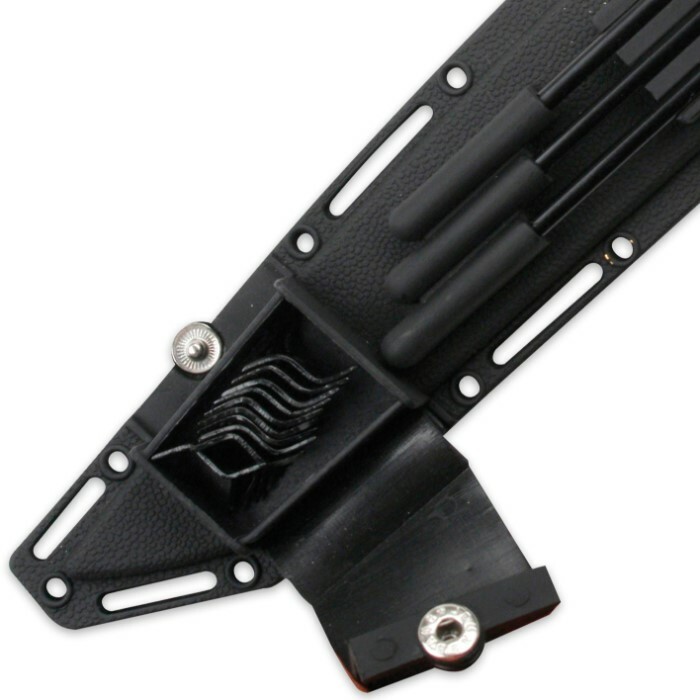 The ABS sheath holds three blade throwing darts positioned for fast access. 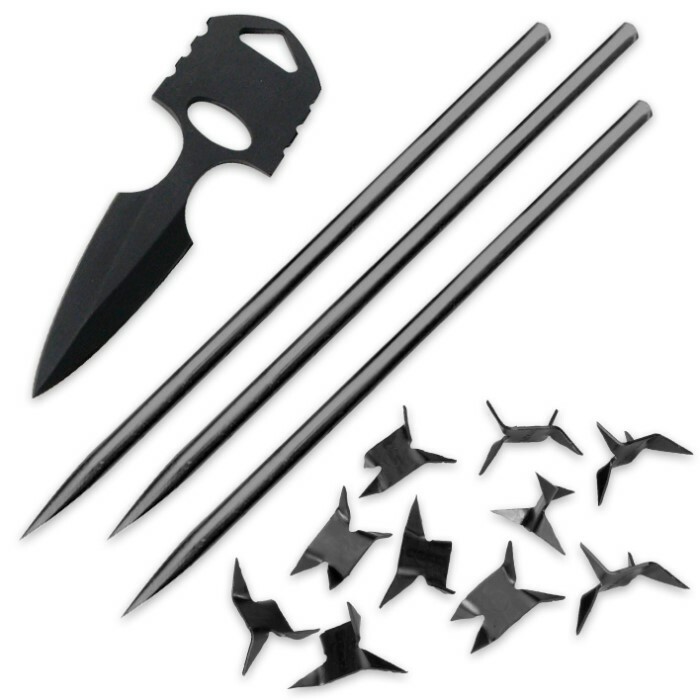 Often underestimated, spike throwing darts have been in ninja tool kits since the beginning due to their low cost and availability. Finally, 10 caltrops are secured within a compartment near the bottom of the sheath. Opening with the click of a snap, the caltrops are instantly in hand and ready for use. The sheath locks onto the blade, giving you the option of keeping the snap open for fast access, or completely locking the knife in place during periods of relaxed use. Featuring a belt loop and many slots for looping cord or straps, you can attach this sheath virtually anywhere. Tanto: 10 3/4 in. overall, 5 3/4 in. blade, 2 in. wide. Push dagger: 3 3/8 in. overall, 1 3/4 in. blade, 1 in. wide.